MRO TOOLS Long Grip Cylindrical Body Cleco Fasteners (CBXL) are designed to eliminate orientation problems of fastener tools that can lead to reduced installation and removal time. MRO TOOLS Long Grip Cylindrical Body Cleco Fasteners feature a double lead thread design that improves installation and removal speed. MRO TOOLS Long Grip Cylindrical Body Cleco Fasteners also feature a large bearing area that makes these fasteners the optimum choice for both composite and metallic surfaces. MRO TOOLS Cleco Fasteners are widely used in automotive, racing, and aircraft sheet metal repair. MRO TOOLS Cleco Fasteners are designed to temporarily fasten multiple sheets of material together before the pieces are permanently joined. MRO TOOLS Cleco Fasteners are a simple and inexpensive alternative to competitive fasteners and are available in various lengths and strengths to accommodate different processes. The MRO TOOLS CBXL-BF3/16 Long Grip Cylindrical Body Cleco Fasteners is one of thousands of quality tooling products available from MRO Tools. Please browse Long (CBXL) 0-1'' Grip Cylindrical Body Cleco Fasteners for tools similar to the MRO TOOLS CBXL-BF3/16 Long Grip Cylindrical Body Cleco Fasteners. MRO TOOLS CBXL-BF3/16 Long Grip Cylindrical Body Cleco Fasteners description summary: MRO TOOLS Long (CBXL) 0-1'' Grip Cylindrical Body Cleco Fasteners. 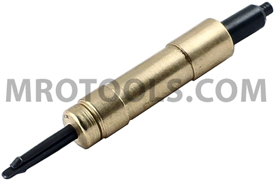 Color: Brass Diameter: 3/16'' Drill Size: #10 Grip Range: 0-1'' Quantity discounts may be available for the MRO TOOLS CBXL-BF3/16 Long Grip Cylindrical Body Cleco Fasteners. Please contact MRO Tools for details.